We started our first day in New Orleans on the run. Breakfast at Cafe Du Monde, a long morning of shopping and sight seeing, and a late lunch at Commander's Palace wore us out! After a little rest in our hotel room, we were ready to get back at it. Haley had not been to Bourbon Street, so we took the requisite stroll down anything goes lane. Since it was the week after Mardi Gras, things were actually on the calm side...for Bourbon Street, that is. 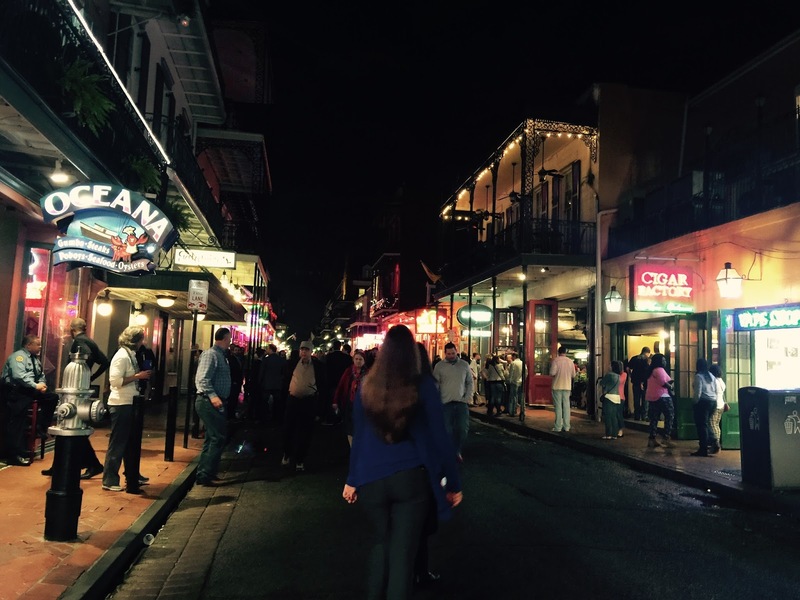 At night, the French Quarter lights up with neon and gets lively with the sounds of music streaming out of the bars. We decided to go completely touristy and duck into Pat O'Brien's. The great thing about traveling with girls is what one orders, the others get to taste, unlike my boys who refuse to share. They don't understand why you just can't get your own. Girls never have that problem, because we would rather share than have to polish off a complete dish or drink own our own. In Pat O'Brien's, Ayla ordered, what else, a hurricane, and Haley and I got a taste. Now I can check that off my list, I've tasted a famous hurricane from the place where hurricanes were invented. All this time, we were getting messages from Scott at home suggesting places he thought we should check out. 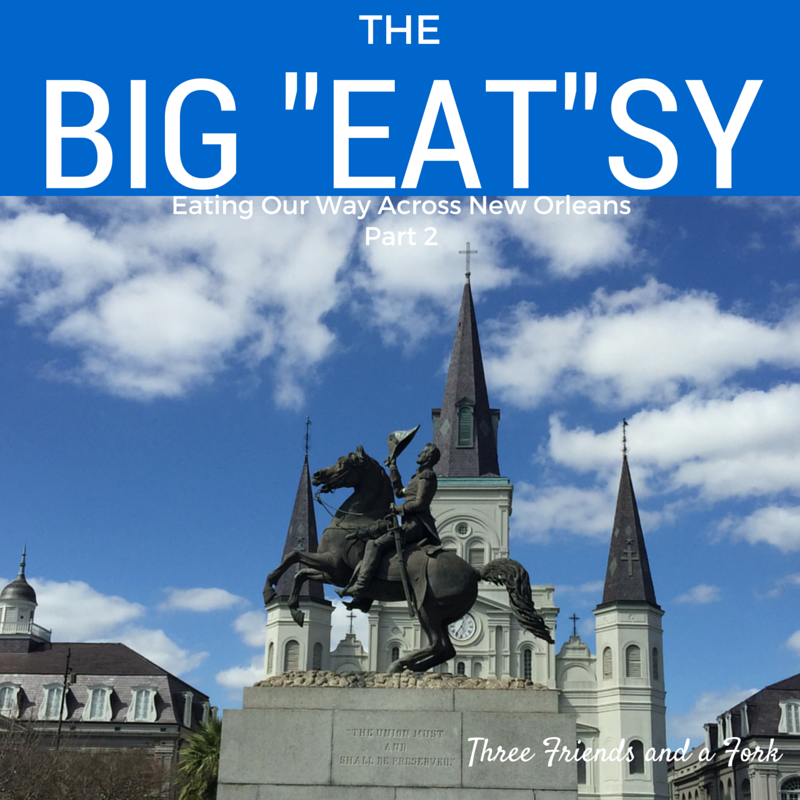 One of the places he wanted us to visit was a restaurant called Mother's which just happened to be near our hotel, so we left the French Quarter and headed that way. It was kind of a crazy thing to do, because it was now almost 10:00. But we hadn't eaten since our 2:00 lunch at Commander's Palace and we were getting a little hungry. Mother's is a large brick building that sits on a corner of Poydras and Tchoupitoulas streets between the Riverwalk and Lafayette Square. It doesn't look like much from the outside, or the inside either, for that matter! But this place has history and a bunch of famous faces hanging on the walls. Mother's is the place that coined the term debris, as in "I would like a roast beef po'boy with debris". That just means the little shavings that fall from the roast as it is carved...you know the little bits you like to pick as your daddy carves the roast. Ayla got this famous sandwich and it was delicious. You can see the sliced roast beef with the debris piled high on top. The sign out front proclaimed "World's Best Ham", so how could I not try that? I also wanted the potato salad, but the plate came with three sides. I knew I would never eat that much at 10:00 at night, so I asked the girls what they wanted me to order to go with it. Haley was going to share with Ayla and me, rather than order a third entree. They quickly said grits and red beans and rice, so we went carbs all the way. The ham was delicious and Haley and I practically sword fought with our forks for the potato salad. It was really yummy. I didn't eat much of the beans and grits, because I was so happy with the potato salad and ham. My not so colorful plate! While we were eating our "snack", Haley instagrammed a picture of Ayla's sandwich with the following comment, "And now it's time for a late night snack." We were thrilled when Mother's immediately replied back, "Oh, no! You'll starve! Better add some gumbo and bread pudding!" Fully fortified (read stuffed) we headed back to our room to get rested up for the next day, while giving Mother's Restaurant 3 Authentic Yums UP. Next up, day two of our adventures in the City that Care Forgot.